INK: Public Archive brings together 56 works by 52 artists from Glasgow Print Studio's extensive archive of over 1500 prints made by artists since the founding of the Studio in 1972. 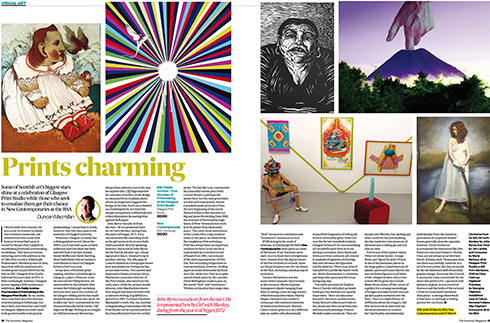 Works range from some of the earliest prints by John Bellany, John Byrne and Philip Reeves to more recent prints by artists such as Elizabeth Blackadder, Jim Lambie and Christine Borland. The works have been selected by AHM (Sam Ainsley, David Harding, Sandy Moffat) at the invitation of John MacKechnie the director of GPS. Ross Sinclair has written of Ainsley, Harding and Moffat: they "…have been instrumental in the development of the culture of art born in Glasgow and exported around the world for over 25 years. Put simply - the very idea of Glasgow as a new and vibrant centre for visual art would not exist on the scale or depth without their sustained efforts over a lifetime." 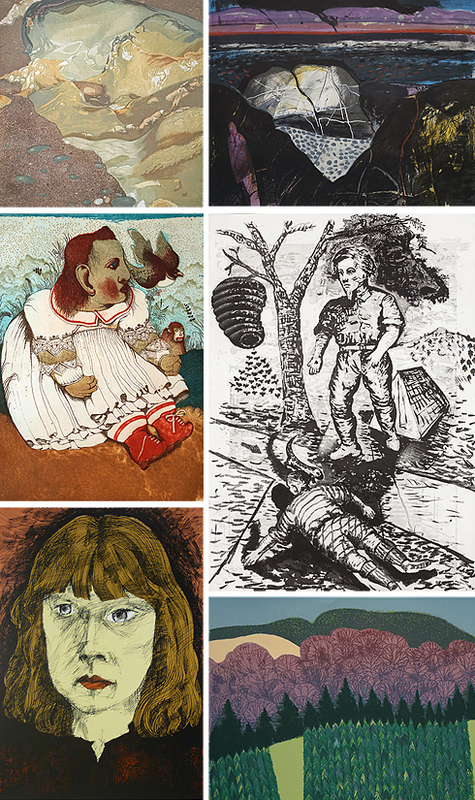 The resulting exhibition demonstrates the full range of printmaking techniques, from older methods such as woodcut, etching, drypoint, mezzotint, collagraph, to lithography, and onwards to screenprint, photo etching and digital imaging. While definitions of ‘what is a print’ may have changed in recent years, the arrival of new methods and digital techniques have not made woodcut or etching redundant, but have simply extended the options available for the artist/printmaker. As Jacki Parry has said, "If you can ink it you can print it." Images (cw): G.W. Lennox Patterson, Wave Sculpture - Kintyre, c.1982, screenprint. Barbara Rae RA, Pebble Bank, 1985, lithograph with screenprint. Steven Campbell, Natural Follies at Bee Junction, 1985, etching. Bet Low, Lennox Woods, 1984, screenprint. Brian McGeoch, Untitled, 1980, screenprint. John Byrne, Girl With Monkey, 1972, etching. Sam Ainsley is an artist and teacher and until recently was Head of the MFA Programme at The Glasgow School of Art. She has forged a remarkable career within the visual arts sector nationally and internationally. In 1991 she co-founded the Master of Fine Art course having taught at GSA since 1981, she has been the course Director since its inception. She is a respected and published spokeswoman for the visual arts and her own artwork is in a number of public and private collections nationally and internationally. David Harding is an artist, writer and teacher. He was appointed Head of the new Environmental Art Course at The Glasgow School of Art in 1985. He taught the course for over fifteen years and, with Ainsley, is widely credited with its outstanding international acclaim. He has written numerous articles on public art and education in contextual practice in art and remains an influential commentator on public art. Alexander (Sandy) Moffat emerged as on one of the Scottish Realist Painters, so called because of their social awareness and rejection of the decorative principles that defined much Scottish art during the first half of the twentieth century. From 1979 Moffat taught at Glasgow School of Art where he encouraged a new generation of Scottish figurative painters including Peter Howson, Ken Currie and Steven Campbell and Adrian Wiszniewski. He was Head of painting from 1992 until 2005. 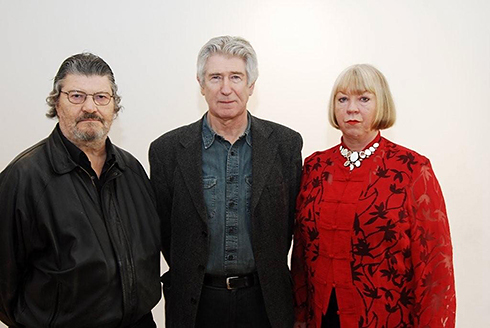 He has written extensively on Scottish art and has curated several important exhibitions of contemporary painting. Above: AHM (from left) David Harding, Sandy Moffat and Sam Ainsley. The exhibition is accompanied by a full colour catalogue and essays by AHM and Kerry Patterson, GPS archivist. The catalogue includes images of every work in the exhibition and is destined to be a collector’s item. Special preview evening price of £10, £15 thereafter. Image: Top of page: Jim Lambie, 'Sun Visor', 2014, 56 x 76 cm, pigment print with spray paint addition in a varied edition of 50.